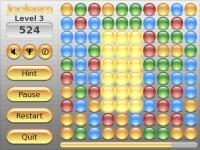 Description: A quite decent and nice looking puzzle game. USR: AND ETC: PROBLEMS FIXED. rectangles. The larger the rectangle, the more time and points are won. Jooleem is free and open source software. Right click - Deselects the currently selected marbles. P - Pauses the game. F12 - Takes a screenshot. The file can be found in the "data/screenshot" folder. Esc - Quits the game. * When stuck, click the hint button. But beware - you will pay a time penalty. more points you get per marble. marble as the game progresses. download. Mac OS X and RISC OS ports are planned. requests on the game's project page - http://sourceforge.net/projects/jooleem/.